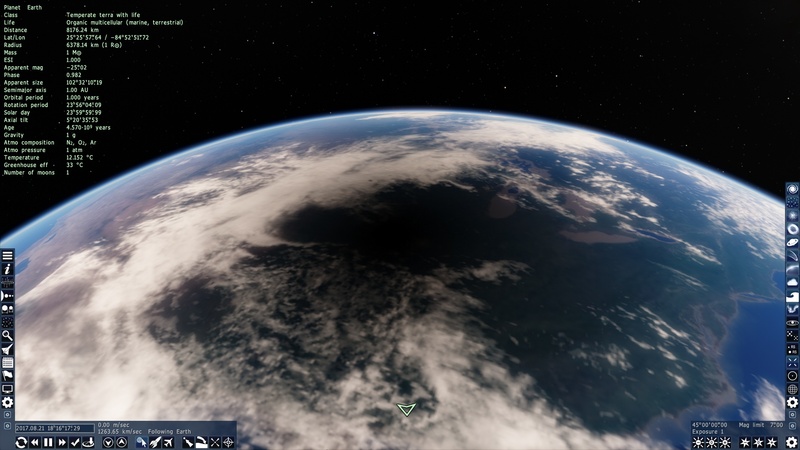 For those who will be unable to see the full solar eclipse on August 21, I made this small patch for SpaceEngine 0.9.8.0. It adds planet ephemerides to SE, so you can watch the eclipse there. It is based on a slightly updated 0.9.8.0 source code with some earliest bug fixes and beginning of implementation of the new UI (thus changed main menu background). I had no time to test this patch carefully, so it may contain new unexpected bugs. It would be logical to call it 0.9.8.1, but this could make a confusion. So I called it SE 0.9.8.0e – “ephemeris edition” or “eclipse edition”. Unpack the archive to the SE 0.9.8.0 folder. This patch is designed only for 0.9.8.0! It’s recommended to make a new separate installation of 0.9.8.0, and then apply the patch to it.